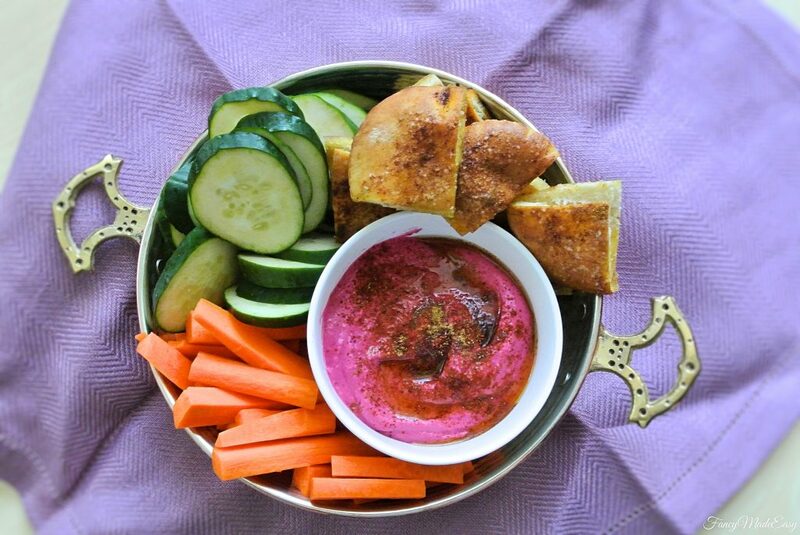 This beet inspired hummus is great for snacking or bringing to a picnic. Preheat oven to 400F. Wash beet throughly and wrap in aluminum foil. Bake until tender, about 30-40 minutes. Remove from oven and let cool. Once the beet is cool, peel the skin off and chop into 1/2 inch pieces. 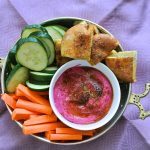 In blender or food processor add chopped beets, chickpeas, lemon zest and juice tahini, cumin, and 1/2 cup of reserved chickpea liquid. Blend 1 min 30 seconds. Add 1 Tbsp. olive oil and salt to taste and pulse to incorporate into a smooth consistency, 3-4 pulses. Add mixture to bowl and make an indentation in the hummus. Pour remaining olive oil into the indentation. Garnish with parsley, cumin, and paprika. Serve with vegetables and pita chips. If it seems that the mixture is too thick, add more chickpea liquid and olive oil to the hummus. Add additional salt to taste.